We are now using GameOfficials.net to handle PYS referee assignments. Referees can log on to GameOfficials.net for the latest schedule. Make every effort to start the games on time. All refs must keep the time. Do not use a cell phone to keep time. DO NOT end a Coastal game early because it is running late. Arrive 20 minutes early to allow enough time for pregame activities: inspect field, make sure the goals have at least two sand bags, inspect players equipment, check game ball, coin toss, etc. You can do these things before the previous game ends. U7s/U8s play 12 min quarters. U7s/U8s play using two fields at once so field 2C will need two refs and field 2D will need two refs. Refs working the same field number should try to start and end their quarters at the same time. If there are not enough players at game time, start one game and then start the other when more players arrive. U7 through U12s - Goalkicks can go directly over the half-way line. Additionally, once a goalkeeper plays the ball with their hands, they can kick, throw, or punt the ball directly over the half way line. It must bounce or be touched in their own half first. If the goalkeeper dribbles the ball outside of their own penalty area or does not play the ball with their hands, then they can kick the ball as far as they want. Violation: U7/U8 - direct free kick from half-way line. U10/U12 - indirect free kick from half-way line. Every official (Referee and ARs) need to submit a game report via GameOfficials.net. You do not need to report scores for U7 and U8 games. Assistant Ref flags will be available at the snack bar. Return them immediately after you use them. Review our Spring Rules Summary. The following publications will help you improve as a referee: Advice to Referees on the Laws of the Game, Guide to Procedures (GTP Amendment), Coastal League Rules (spring only). Please use GameOfficials.net to report the games that you officiate within 24 hours of the game. There is no need for the coach to sign anything. You can bring a blank index card or piece of paper to the game to write down the information you need or to keep track of the score. You should always keep score for U10 games, fall and spring, because it develops good habits. There are ref score sheets you can find online that you can print yourself to help you keep track of the game info (sample ref score sheet). As you progress to different age groups, the game often changes with regard to rules and the intensity of play. See Referee Age Group Considerations to get a better idea of how expectations will change in different age groups. Under the direction of the Massachusetts State Referee Association, PYS has implemented a Referee Mentor program to support its referees. The goal of this program is to provide our young referees the support structure they need to be successful. Referees are encouraged to seek out a mentor if they have questions or concerns. Complete information on refereeing in Massachusetts is available on the Massachusetts State Referee Committee (Mass Ref) website. If you will be at least 12 years old by the start of the season, you can become a Grade 9 recreational referee by taking an 8 hour course and passing a test. This lets you referee non-competitive games and assistant ref on most other games. If you are 16 or older you can become a Grade 8 referee by taking a 16 hour course and passing a test. This lets you referee just about any youth game which the referee assignor thinks you're capable of handling. Grade 9 referees can move up to Grade 8 after they have at least one years experience and if their age plus their years of experience is 16 or more. To move from a Grade 9 to a Grade 8 you must take the 8 hour Grade 8 Bridge course and pass the test. For a course listing, visit the Course List at the Mass Ref website. The list is updated often, especially during the off-season. Offside Rule Animated (Lo Res / Hi Res) from Dynamic-Thought.com - Great explanation of the entire offside rule. FIFA Interactive Guide - Another great explanation of the entire offiside rule. US Soccer Videos - There are some great videos explaining the rules as well as videos demonstrating proper signals for the referee and assistant referees. Have a Ref Question? Then Ask The Ref! There are many resources available to soccer refs over the internet. One of the best is AskTheRef.com. Here you can find questions and answers from soccer referees all over the world. From the common to the un-common - just about everything is here. Some of the referees on the AskTheRef panel have 3,000 games of refing experience behind them and work A-League or MLS games. Visiting this site will certainly improve your refing skills. The PYS Referee pay scale was last updated in March, 2013. PYS is proud to be the first employer for many of our kids. Through refereeing, kids can learn the responsibilities that go with any job like being on time and maintaining a professional appearance. Refereeing is also great for developing good interpersonal skills. 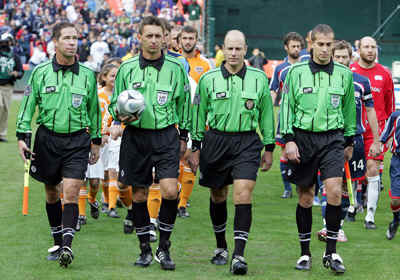 On November 17th, 2007, the USSF launched a new "official" referee uniform at the MLS Cup. The new uniform features a redesigned shirt and socks. The new design features include an updated stripe pattern and a colored notch on the back collar. Also featured on the sleeve of the shirt and on the shorts is the updated U.S. Soccer Referee Program logo. A new color, green, has also been added to existing gold, red, blue, and black. Referees will have two options on the type of sock they will wear. The new sock is embroidered with “U.S. Soccer Referee” on the foot of the sock, but referees are also permitted to wear the three white-stripe sock or the black sock with the old U.S. Soccer Referee Department logo, as both are still USSF-approved. Going forward, Official Sports will only sell the new style. In youth and adult amateur games, it is acceptable for the crew to wear the old uniform or combination of new and old uniforms. Referees are encouraged to purchase the new uniform when replacing their old version. For more information, please contact the PYS Referee Coordinator, Bill Tholen at 774-288-0015 ( ). ACROBAT READER from Adobe is required to view the Referee Test.